Britain's longest trail, the South West Coast Path stretches for 630 miles (1, 014 km) from Minehead, on the edge of the Exmoor National Park, along the coasts of Devon and Cornwall to Poole in Dorset. The path is an excellent way to see Cornwall's superb coastal scenery, wildlife and unique heritage. In iis Cornwall section the path traverses a variety of scenery, cliffs, secluded coves, and awe inspiring rock stacks such as the Giant's Stepping Stones at Bedruthan Steps. For shorter walks, spectacular areas of the coast include Crackington Haven, which is one of the loveliest sections of the path, the Lizard, and the Camel estuary, and the Roseland Peninsula. 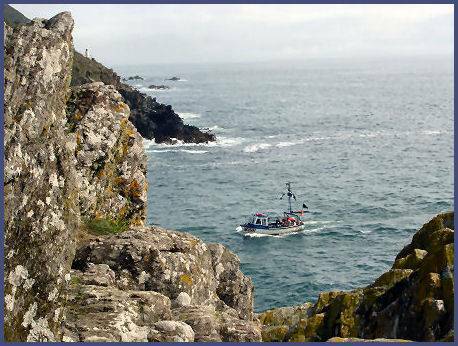 Various marine creatures can be sighted, grey seals, turtles, common dolphins and the occasional basking shark. The cliffs are home to a variety of sea birds, cormorants, petrels, puffins, shags, and guillemots. 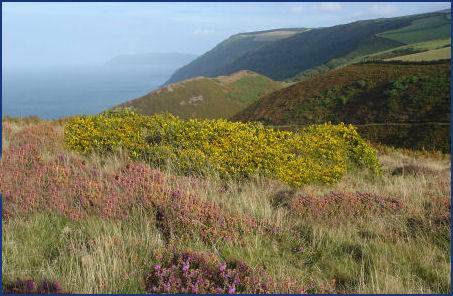 Commencing at the town of Minehead in West Somerset, the South West Coastal Path follows the shore to Culver Cliff before entering the beautiful Exmoor National Park with its superb rocky headlands. 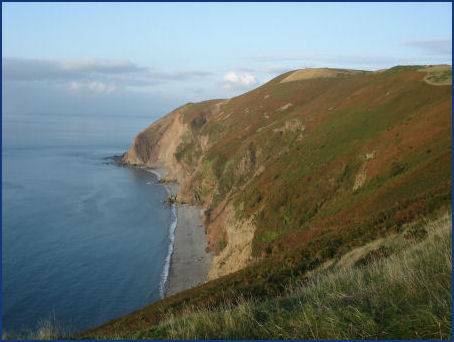 The path then passes inland by Selworthy Beacon and Bossington Hill before rejoining the cliffs at Hurlestone Point and continues to attractive Porlock Weir, which boasts a fascinating history dating back over a 1,000 years. From Porlock the route joins with the Coleridge Way. The path crosses the boundary into the county of Devon near to the National Park Centre at County Gate, and continues through the villages of Lynton and Lynmouth, which was the scene of a disastrous flood in the 1950's before reaching the dramatic Valley of the Rocks, a popular tourist location situated half a mile west of Lynton, the spectacular valley is unlike any other combe found on the Devon coast. The valley which was formed during the Ice Age has impressive weathered rock formations, such as ' The Devil's Cheesering', Castle Rocks' and 'Ragged Jack'. The rocks are inhabited by a population of wild goats, who can be seen scrambling amongst the rocky outcrops. 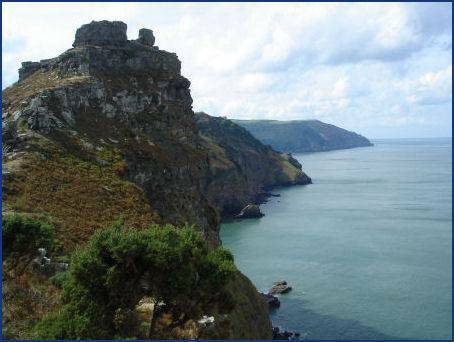 The Coastal Path then follows the Devon coast, crossing the Great Hangman, which at At 1,043 feet (318 metres)is the highest point on the path and the highest cliff on the British mainland. It then enters the lovely Devon village of Coombe Martin, before leaving the Exmoor National Park. The South West Coastal Path enters Cornwall at Marsland Mouth, passing through the village of Mormenstow, a haunt of smugglers and famous for its associations with eccentric, and reputedly opium-smoking, vicar and poet Robert Stephen Hawker. It then passes through the north Cornish seaside resort of Bude, before returning to the cliff tops and proceeding on on to Crackington Haven, and from there to the village of Boscastle, which saw disastrous flooding in the summer of 2004. It passes dramatic Tintagel Castle, spectacular and atmospheric, thirteenth century Tintagel Castle stands on the site of an earlier Dark Age fort, reputed to have been the birthplace of the legendary King Arthur. The castle stands on a rocky windswept headland rising around 100 metres from the sea, which is linked to the mainland by an ithmus of rock and surrounded on three sides by the Atlantic. After leaving Tintagel, the route proceeds to Pentire Head passing through Polzeath and entering the town of Padstow, from where it passes Trevone and Harlyn Bay then around Trevose Head . The views from the storm battered granite headland into Devon are magnificent. The path continues through Constantine Bay to Porthcothan then passes around Park Head to reach Mawgan Porth. The long, sandy Watergate Bay leads to Newquay, one of Cornwall's most popular resorts, the town boasts 7 miles of golden sands and is surrounded by 11 superb beaches. The path folows Pentire Point West and Kelsey Head to arrive at the village of Holywell, the clean and safe beach at Holywell Bay is owned by the National Trust and is nearly a mile long. It is a popular spot with surfers. After passing round Penhale the path enters Perranporth, then climbs out the other side back onto a stretch of cliffs past Kligga Head to the village of St Agnes and rounds St Agnes Head, where the ruins of Towanroath Mine can be seen. The path then enters the village of Porthtowan and drops into he pleasant coastal village of Portreath, the secluded sandy beach there is suitable for surfing and windsurfing. Beyond the cove at Hell's Mouth, the path runs northwards to pass around Navax Point, which is owned and maintained by the National Trust, just offshore lies Godrevy Island , which was the scene of a famous shipwreck in 1649. Atlantic seals can sometimes be seen, although elusive and preferring the rougher seas. In summer porpoises have been sighted from the point. Proceeding south to Hayle the path then enters the popular resort of St Ives, the artistic capital of Cornwall, and arguably one of the most popular holiday resorts in the county with its four beaches and a wealth of history and tradition . The path continues to traverse Zennor Head and Gurnard's Head and continues by the small fishing picturesque village of Morvah. Passing dramatic Cape Cornwall, which holds the distinction of being the only cape in England, the cape is situated at the point at which Atlantic currents divide, either going south towards the English Channel, or north into the Bristol Channel and the Irish Sea. The route then proceeds in a southwards direction to Whitesand Bay and the village of Sennen, before turning west to arrive at Land's End, with its spectacular crashing waves which lash the rugged Cornish cliffs, is the most westerly point in England and one of the most visited places in the county of Cornwall. 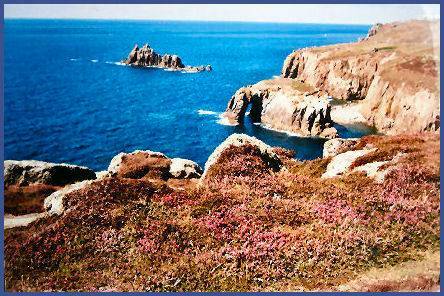 Land's End was known to the Romans as 'Belerion' meaning the sea of storms, while it is known in the Cornish language as Pedn a Wollaz. Entering the bustling port of Falmouth via the headland of Pendennis Point, on which stands Pendennis Castle which was built by King Henry VIII from 1540-1545 as a coastal defence at the entrance to the River Fal, the route then crosses the harbour on the St Mawes Ferry and proceeds to St Anthony Head and onwards to he small and unspoilt Cornish village of Portloe, the village lies in a superb location at the foot of a steep valley leading into beautiful Veryan Bay. It is the very essence of a Cornish fishing village, with a small fishing fleet hauled up onto the pebble beach by the harbour, while lobster pots and nets crowd its quay. The busy fishing village of Mevagisey is a captivating place with a charm and atmosphere all of its own and is one of the oldest fishing ports in Cornwall. From there the Coastal Path continues, via Black Head to the town of St. Austell. After passing Carlyon Bay, the path merges with the Saint's Way and goes on to the hamlet of Polkerris, which situated in an idyllic cove, is a popular location with holidaymakers, and continues around the dramatic headland of Gribbin Head the distinctive red and white striped day navigation beacon, the Daymark Tower which perches at the top of the headland was erected in 1832 as a safety measure. The path passes through the busy harbour of Fowey and enters the picture postcard village of Polperro which has the reputation of being one of the loveliest fishing villages in Cornwall, with characterful streets descending to a picturesque harbour. A brook flows through the village down to the harbour. Polperro was once a thriving centre for smuggling and is still a working fishing village. From Polperro the path wends onward to Looe and on to Whitsand Bay before passing back into Devon beyond Kingsand and Cawsand. Passing therough Plymouth the path then proceeds along the beautiful South Devon coast to Wembury. It fords the River Erme near Kingston and follows scenic cliff top paths to Bolberry Down and Bolt Head.and the tidal ria of Kingsbridge Estuary to Prawle Point, which is owned by the National Trust. The estuary includes a ferry crossing at Salcombe, near Salcombe Castle and within the South Devon Area of Outstanding Natural Beauty The path then continues around Lannacombe Bay to Start Point and its Lighthouse and then through Start Bay along a 3-mile (5 km) shingle causeway between Slapton Sands and the Slapton Ley freshwater lake and nature reserve before entering the estuary of the River Dart and historic port of Dartmouth. 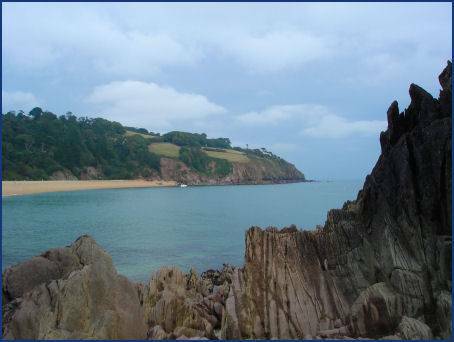 It then proceeds to the popular resort of Dawlish and onto Exmouth, near the start of the Jurassic Coast, a World Heritage Site. It continues via Sidmouth, Lyme Bay and Beer to reach the boundary with Dorset. Crossing the Dorset border the path enters the town of Lyme Regis and continues passing through Charmouth and West Bay, near Bridport, to Burton Bradstock and Chesil Beach. The path circumnavigates the Isle of Portland, passing the lighthouses at Portland Bill and the Weymouth and Portland National Sailing Academy in Chiswell, and returns across Chesil beach to Wyke Regis and along the shores of Portland Harbour to the Nothe Fort in the resort of Weymouth. The path then follows the shores of the Isle of Purbeck to Durdle Door, a natural arch which has been described as "one of Dorset's most recognisable features"., which lies just to the west of the Lulworth Cove, the most visited geological locality in Britain. Between St Alban's Head and the resort of Swanage is Durlston Country Park nature reserve. North of Swanage is the chalk Ballard Down, the eastern tip of which has been eroded to form Old Harry Rocks - a series of stacks, arches and caves jutting into the sea between Swanage Bay and Studland Bay. This headland marks the end of the Jurassic Coast World Heritage Site. The South West Coast Path ends at South Haven Point, where there is a commemorative marker.